TEPCO officials say more than half (23 of the 41) of the thermometers at the Number 2 reactor are not working. 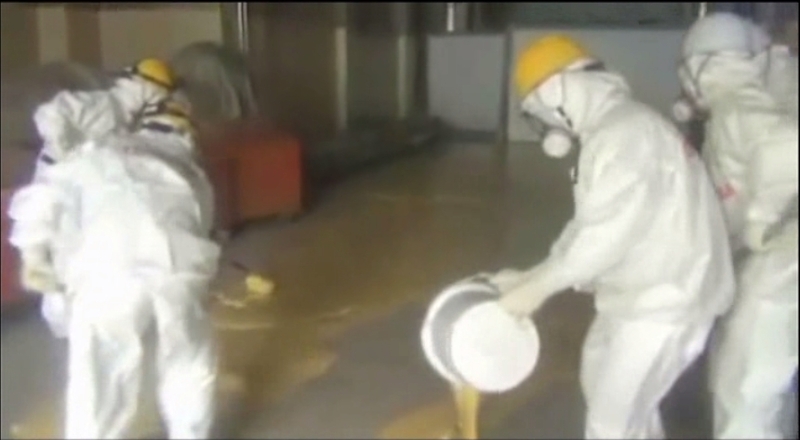 TEPCO says high humidity inside the reactor may be to blame. The utility says it will install new thermometers by late July. They are preparing by decontaminating the areas where work will need to be carried out, and developing a procedures for installation. Japan’s Securities and Exchange Surveillance Commission has asked US authorities to investigate a US investor for alleged insider trading involving shares of Tokyo Electric Power Company. The U.S. investor is believed to have obtained information on TEPCO’s capital hike plan from Nomura Securities Co., which lead-managed the share issue, through an agent before the announcement of the plan, according to informed sources. Based on the insider information, the investor sold TEPCO shares on short, expecting that the firm’s stock price would fall after the announcement, and illegally obtained profits, the sources said. Nuclear disaster management minister Goshi Hosono has postponed his visit to Fukui Prefecture, which had been slated for this weekend for talks over the possible restart of two idled reactors at Kansai Electric Power Co.’s Oi nuclear plant in the central Japan prefecture, and is now expected to visit the prefecture on Monday or later, according to the sources. The central government has delayed coordinating his visit after the Fukui prefectural government urged the state to further clarify Prime Minister Yoshihiko Noda’s responsibility in the restart of the No. 3 and No. 4 reactors at the plant, the sources said. At Wednesday’s meeting with Hosono and two other relevant ministers, Noda said he will make a decision on the restart of the two reactors with his responsibility as prime minister. European Union Energy Commissioner Guenther Oettinger has said that the EU intends to cooperate with Japan in nuclear reactor stress tests and share information as part of the two sides’ collaboration to improve nuclear plant technologies and establish new safety standards. The EU and Japan introduced stress tests to measure nuclear power reactors’ ability to withstand emergencies such as huge earthquake and tsunami in the wake of the Fukushima nuclear disaster. In a recent interview, Oettinger said that decisions on whether to continue or end dependence on nuclear power should be made by governments, parliaments and citizens. Kagoshima Governor Yuichiro Ito vowed Friday that he will continue freezing procedures on Kyushu Electric Power Co.’s plan to build a new nuclear reactor as long as he remains in office. Ito told reporters that he will include the decision not to resume the procedures for the No. 3 reactor at the firm’s Sendai nuclear plant in the southern Japan prefecture in his campaign manifesto for the July 8 Kagoshima gubernatorial election. Ito plans to run in the election for a third four-year term as Kagoshima governor.